As experienced Chicago car accident attorneys we handle many cases involving highway or interstate accidents. Driving on a highway can be a frightening experience even for the most experienced driver. Multiple factors can contribute to highway accidents that can cause catastrophic injuries and death. Many of the vehicles traveling on an interstate are traveling at high speeds. The interstate highways are packed with commercial trucks and buses. The massive size of these vehicles coupled with increased speed can lead to catastrophic collisions. After a collision on an interstate accident, a thorough investigation of the highway accident is critical to preserve the evidence relating to your highway accident case. At Nemeroff Law Offices, our experienced Chicago highway accident attorneys will meet with experts in the field of highway accidents. These experts will be used to reconstruct the accident scene and to preserve physical evidence. Some of these experts are professional investigators, accident reconstruction, traffic safety experts, and truck accident liability specialists. These experts will be involved in obtaining critical information regarding the accidents. They include video or photographs of the accident site, interviewing witnesses, analyzing evidence. Evidence includes reviewing skid marks or any debris left at the accident scene. At Nemeroff Law Offices we handle a variety of interstate accidents and highway collisions for clients in the greater Chicago, Illinois, area and throughout the state of Illinois. If you have been sustained injuries or a family member of a loved who has been injured in a Chicago highway accident involving a car, truck or a commercial tractor trailer, it is critical that you promptly take action. 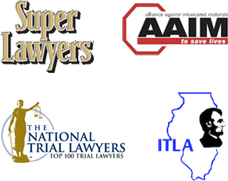 Contact the Illinois and Chicago highway accident lawyers at Nemeroff Law Offices today.